The Dutch prime minister says he will not intervene in the Dutch royal family’s decision to sell a chalk drawing by Peter Paul Rubens at Sotheby’s New York, according to Salima Belhaj, a member of the liberal D66 party. The sketch is estimated to fetch $2.5m-$3.5m on 30 January. The Rubens study is due to be auctioned along with 12 other Old Master drawings, as well as Chinese porcelain, tableware and silver from the collection of King William II of the Netherlands (1792-1849). Earlier this month, Belhaj called on the prime minister Mark Rutte to request the auction be postponed, saying that the pieces should be offered to Dutch institutions first. But Rutte responded by saying it is “a private matter for the royal family”, Belhaj tells The Art Newspaper. D66 will now appeal to the royal family directly. “They could determine whether any Dutch museums might be interested in buying these works of art before they are auctioned off abroad. Then the Dutch public could still have a chance to enjoy these drawings. If the works go abroad, we will not see them again,” Belhaj says. Dutch museums that plan to deaccession Old Master works are obliged to gauge interest from other institutions in the Netherlands before involving auction houses, but the rule does not apply to private collectors, including the royal family. Sjarel Ex, the director of Rotterdam’s Boijmans van Beuningen, has also called on the royal family to withdraw the works from auction, to give museums such as his the chance to secure the pieces. The Boijmans, which is currently being refurbished, has the largest number of works by Rubens in the Netherlands. “There has been no consultation and that is not the right royal way,” Ex told the Dutch newspaper AD. “Going to auction means the owner is only after the biggest prize […] If we could acquire the drawing it would be the most important piece in our Rubens collection.” A spokeswoman for the Boijmans museum says the royal family has not responded to Ex’s request to withdraw the works. 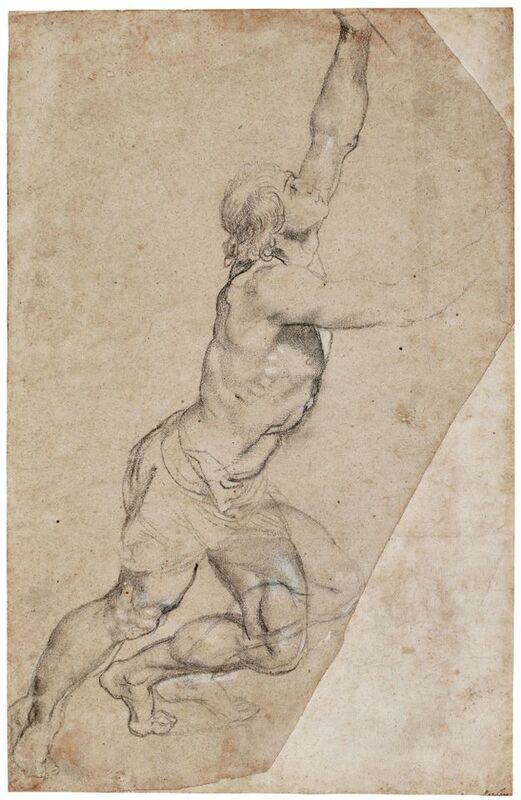 According to the Sotheby’s catalogue entry, the sketch of a muscular young man was acquired from Sir Thomas Lawrence by King William II in the 1830s “to sit beside masterpieces by Raphael, Michelangelo, Leonardo and Rembrandt”. It has remained in the royal family ever since. It is widely believed the seller is princess Christina, the former queen Beatrix’s youngest sister. The drawing is one of a handful of studies that survive of the key figures in Rubens’s altarpiece, The Raising of the Cross, which the artist painted for the Antwerp church of Saint Walburga at the end of 1608, shortly after he returned from Italy.